I finished piecing the blocks last night for my HST quilt top and sewed them all together. Now onto the back. I can't stand a blank design wall. I decided to take a few minutes to lay out these hexagons. I'm really loving it. Kristen over at So Happy assures me these are a piece of cake to piece. She even has a tutorial. I'm joining up with Elizabeth's QAL for a kaleidoscope quilt. This quilt has actually been on my list for a while, and I figure it will be more fun to do it along with others. Also, I think I've found what I want to do with some of my Heather Ross fabric. 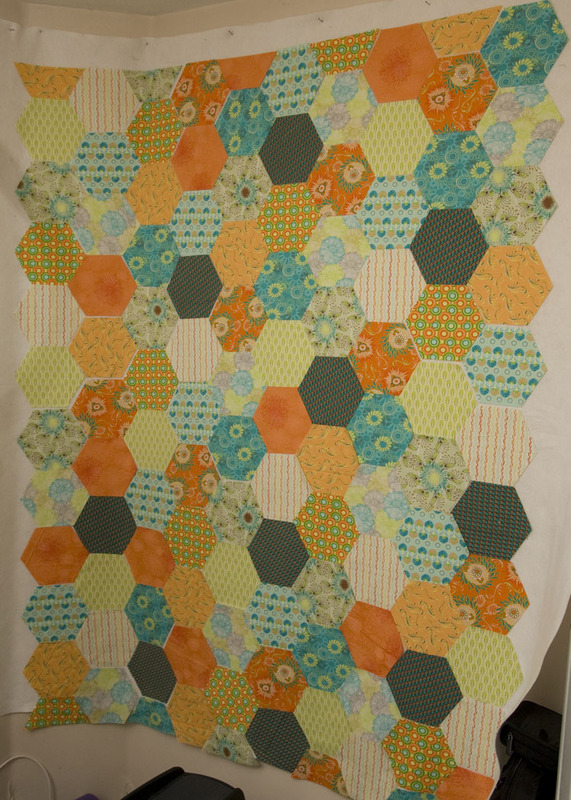 Check out Lee's tutorial on her Hexing Around Block over at Freshly Pieced. I'm stealing Lee's picture here to show you how cute her idea is. I think my bikes and VW buses would be so cute as fussy cut centers in these blocks. Now I just need to find the perfect border fabrics. I'm also linking up for Lee's WIP Wednesday, but it's being hosted over at Don't Call Me Betsy today so head over there to check it out. Kati, I am in LOVE with all your projects. They are fabulous! Beautiful quilts this week. I was loving the kaleidoscope quilt along as well as the hexing around block, too. Don't know if I'll jump in right now, but I do love them both. Wow, I love just everything on your list this week!!! I love the idea of using Lee's hexing around block for your Munki stash, that's going to be fantastic. And I can't wait to see what you do with your HST and hexagon projects. Thanks for linking up with WIP Wednesday! I love your HR Hexagon plan! That block is on my to-do list too. Love them all! Thanks for the link to the Hexagon piecing tutorial. These are on my to-do list also and that will be a great resource. Can't wait to see what you do with Elizabeth's quilt a long! 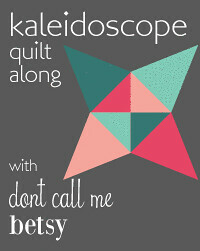 I'm thinking I will join the kaleidoscope qal, too. So much funner with other people doing the same thing. Love the idea of using your Munki stash for the hexy quilt. That will be gorgeous! Lots of beautiful things happening at your house this week! Mmmm I was pondering the kaleidoscope quiltalong - I'll wait for the fabric requirements so I can see if I have enough of what I'm thinking of - really can't justify buying any more fabric just yet (that's what I say now...!). And... that made my day!! I did nothing this week but clean out the sewing room, rip out HSTs orientated wrong, and take care of sick kiddos! I have made two kaleido quilts - it is my favourite block of all time! I would love to join your quiltalong but I have a report that is a monkey on my back right now - I can't take on anything new and exciting until that is finished. Love all your other projects, too! geez, I don't even know what to comment on. Awesomeness in all images. and I can't stand a blank design wall either! i'm loving your HST quilt top! so pretty! HR fussy cut hex around the blocks would be amazing. 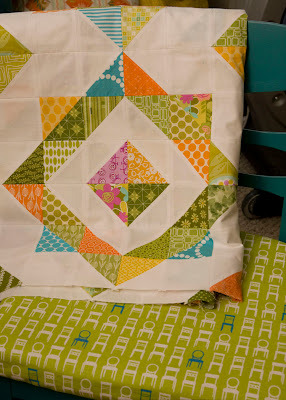 Love you HST quilt! Looking forward to the kaleidoscope quilt along right there with you! It is all so nice! I have some blocks like those in your quilt made and you are motivating me to get back to them, thank you. I love your hexagons on the wall, and I love your idea for a Lee-agon. The Heather Ross will be perfect!